Air Block : Aerocrete (Thailand) Co.,Ltd. » TechniqueAir Block : Aerocrete (Thailand) Co.,Ltd. Suggestion that formation with Masonry Mortar 50 kg/bag. Products was available in the market such as TPI M310. Masonry Mortar Mixed with water. Mix the mortar in the proportion of 50 kg per 12 liters of water (about 2 tanks), mixed well. (Or according to the manufacturer). Note: The mortar begins to harden. Do not bring it to produce strictly prohibited, and masonry about 2-3 mm. Started as a first step .Level defining the wall and mixed with mortar. Align the level of along the wall to the right level and bring the clot blocks prepared mortar with a trowel before applying. Then the clot blocks the formation Alignment and level has to facilitate the formation of the next layer. Blocks formation of each layer. Mortar must either block the formation of them and block to generate leads. Sorted block switch like the brick and concrete blocks. The horizontal blocks overlap at least 10 cm, or half of the block length. The formation of reinforced concrete or steel pole. 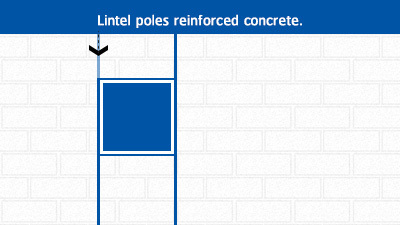 The formation of reinforced concrete or steel pole will need to plug small diameter round bars ø 6 mm. at every pole height up to 6 cm by steel pole are used to connect ø 6 mm. round bars attached to the pole. Formation blocks the beam or the floor. Formation blocks the beam or the floor need some space about 1-2 cm., and then sealed with cement, But if the floor beams into collision with the opportunity to produce blocks dropped down to the Post Tension system or structure. 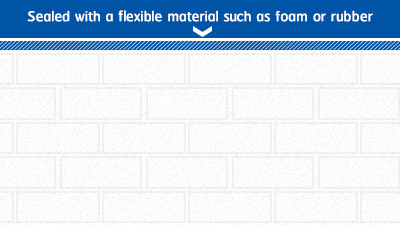 Be a space of not less than 2.5 cm, then sealed with a flexible material such as foam or rubber. Formation blocks the beam or the floor need some space about 1-2 cm. The floor beams into collision with the opportunity to produce blocks dropped down to the Post Tension system or structure. Be a space of not less than 2.5 cm, then sealed with a flexible material such as foam or rubber. Installation of door and window frames have to do lintels, reinforced concrete pillars. Banded around jamb windows – doors. In the case ,Blocked wall use the scraping tool groove / The Power Cutter Cutting depth is then used to extract block walls into the trenches for water pipes buried conduits. ( Will be easier to brick. And concrete block). 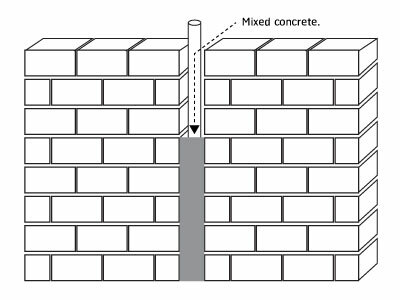 Groove depth should not exceed 1 in 3 of the previous blocks when installing pipe Or conduits then covered with cement. Another case of installing conduits or plumbing before block formation. Except for the pipe, and then cement, sand enclosed vertical pipe. 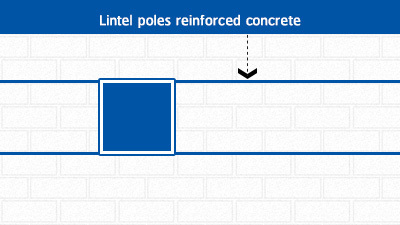 Poles and lintel installation to block wall strength. It can resist the force that. 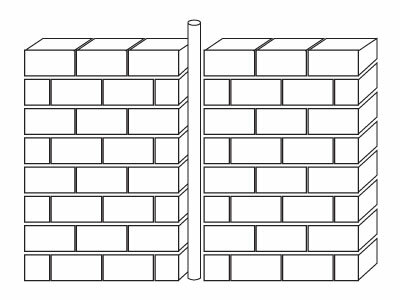 Masonry blocks are longer or exceeds the standards set by the square pillars and lintels must be made through the height and the length of the wall thickness of the pillars and lintels. Equal to the thickness of the block size that produces reinforcing steel bars, round steel ø 6 mm 2 lines must be buried deep in the ground and the top beam. 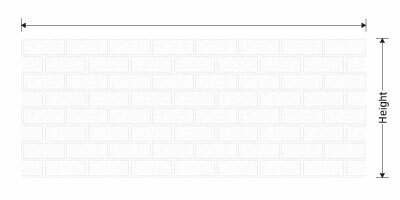 Distance vertically and horizontally for a block size for various wall at the side pressure of 25 kg /Sq. m.
The thickness of the clot blocks (cm.). Along the four walls attached to the pole. or beam along. 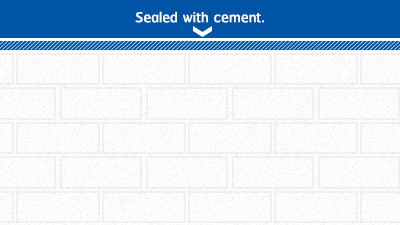 cement plaster ready-made type products such as TPI M210, plumb, tiger. cement plaster mixed type products such as tiger, TPI. Cement plastering ready-made type products. Before plastered with cement Walls must rise by at least 1 day. For the interior wall surface must be clean. and wetland reasonably not to absorb from the wall cement plaster too quickly. This can cracks and impair strength. and the making the wetland itself. It began with plaster. Cement plastering should be applied at least one layer, each layer has a thickness of less than 1.5 cm. On the second floor, then the case should not exceed 2.5 cm. But not more than 1 cm thick plaster layer is applied first, then the surface is smooth without a second coating layer. For the first cement plastering mixed relatively liquid cement plaster. When finished plaster Before the plaster hardens the skin should limit surface groove (scratching the line) to achieve cling to plaster (Layer 2) should start plastering. After the first plastered. Interior wall. 1 day leave it plastering the first layer, then the plastering layer 2. Exterior wall. 3 days leave it plastering on the first layer, then 2nd layer plastering have to splash onto wet plastering on the first layer before the same. Cement plastering of the points that are easy to crack. Boundaries between the walls and structure. To prevent cracking of plaster. Need to use steel wire mesh (Meter Mesh) strain on the surface plaster floor. The wider the line wire steel mesh cover. Each side of not less than 10 cm.